+ You & I: Pawsome Twosome! + Protective and Fearless The Central Asian Shepherd! + An insight into Breeding – which is important for all! + What Makes Your Dog’s Kibbles Taste So Great ? + Return from freaky freedom! + Be Cautious with Collars: Learn to make an informed choice! + Wagging all around with Randeep! Q: I am shifting from Bengaluru to Pune. I have two cats – three and five years old – who have never travelled. What is the best manner to travel with them – by road or flight? How do I accustom them to travel? Should I buy separate crates for them? cage/crate that can be easily cleaned and disinfected. Cats being transported by whatever means should always travel in a safe carrier. If your cats live together and are familiar, you can put them in a single carrier. The pets should also have a tag to make it easy to track them if they get lost. Visit a vet prior to your journey to ascertain that the pets are in good health and are vaccinated. Give them a light meal about two hours before they travel. Let your pets ‘try out’ the carrying container before the trip and put a familiar-smelling stuff in the container to help your pets settle. Give your pets the opportunity to go to the toilet before they are put in the carrying containers. If you are planning to travel by road, make sure your cats are accustomed to car travel. This can be done by letting the cats just sit in the car without the car moving. When the cats are comfortable with this, take the cats round the block, and gradually move up to taking the cats on journeys for 5 minutes, 10 minutes, etc. You will also know if they are likely to be sick or excitable in the car. If your pets’ car sickness is truly motion related, your vet can also prescribe medications to fight travel illness. teacher’ award in the year 2000. He is a member of European Society for Vet Dermatology and is currently working for WALTHAM as Regional Associate for South Asia. Q: My dog is often coughing. The vet is saying he has allergy and has given anti-allergic medicine, cough syrup and a tablet. But it’s not yet cured and recurred recently. What’s the cure? 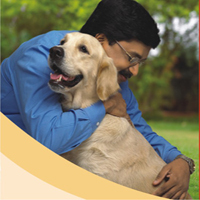 Dr KG Umesh: Recurring or long-standing cough in a dog can be due to chronic bronchitis or airway collapse; however, diseases such as infections, heart disease and other chest diseases must be considered. Appropriate management of cough requires confirmation of disease and exclusion of other causes of cough. Tracheal collapse is a common cause of acute or chronic cough and respiratory distress in dog and is seen most often in toy and small breed dogs. Dogs with airway collapse generally have a chronic honking (goose honking) or seal bark cough that is paroxysmal in nature. Coughing is often triggered by eating, excitement, exertion, or pulling on the leash. Your vet may advise radiography, ECG, echo, fluoroscopy or bronchoscopy in addition to some blood tests. Medical therapy for animals with airway collapse includes management of obesity and concurrent medical conditions as well as control of infectious or inflammatory airway disease. Dogs who fail to respond to aggressive medical therapy may require treatment surgically or stents in case of tracheal collapse. Q: We live in an apartment and have two kids aged 10 and 6, wanting to adopt a pup. Can you advice on a suitable breed? Dr KG Umesh: One of the most important aspects to ensure a happy relationship between you, your family and your dog is to ensure that your dog’s requirements can be matched by your lifestyle and environment. The size of your house and more importantly, the availability of open spaces nearby for exercise will influence the type of dog you should choose. Small breeds like Boston Terriers, Pugs, Spaniels and Dachshunds, etc may be better suited if space is limited. The initial cost of your puppy must certainly be taken into account, but be aware that other costs continue for the rest of his life. The daily cost of feeding, veterinary visits, kenneling during holidays and regular grooming sessions for certain breeds. Preventive health (vaccinations, de-worming) and practicing good hygiene will keep away most of transmissible diseases. Q: My Pug is two and a half years old and vaccinated. His nails on the paws are very sharp and he keeps prancing and in his zest, someone or the other always gets scratched by his sharp nails. Also when someone gets hurt, scratched – what do we do? Does the person require a tetanus injection? Dr KG Umesh: Unlike cats, there are no serious diseases that are transmitted by a dog scratch. However, pet nails contaminated with harmful bugs can result in some infection in humans. Try to minimise your chances of getting scratched: Avoid rough play and other activities with pet who could lead to biting and scratching. Keep your dog’s claws trimmed. If you do get scratched or bitten, wash promptly with soap and water. Practice good hygiene at home. Generally, there is no need to get tetanus shots. Q: I have a 45-day-old Rottweiler puppy, under process for KCI Registration. Please advice on his food and vaccination? Q: My Golden Cocker is 10 years old. Under her right eye, there is a small lump/extra growth. It gives the appearance of a small human mole. What should we do? Dr KG Umesh: Warts or benign growths are common in senior pets. However, any growth/lump in a senior pet requires immediate medical attention. Your vet will decide suitable action depending on place and nature of growth. How I came across my vet: Referred by my neighbours. How long have I been visiting my vet: Since last three years. Toughest medical challenge faced by me and my pet: Mikito had very indigestion and stomach upset, which turned out to be infection with pancreas affected. Role played by my vet in helping to overcome it: Proper medication advice and recommended necessary diagnostic, diet and medicines. A special quality about my vet: Very warm and friendly. A ‘Thank You’ note for my vet: Thank you Dr Anju for all your services. How I came across my vet: His hospital is just a few footsteps away from our house. Do I visit the vet for regular check-up or only in case of medical condition: For both purposes. How long have I been visiting my vet: Since last six months. Toughest medical challenge faced by me and my pet: Harry had vomiting and dysentery as it was his first summer in life. Role played by my vet in helping to overcome it: It was on Sunday, mostly all vet clinics were closed, but I called up Dr Ghoore who prescribed some medicines on phone. After having the medicines Harry was fine after sometime. Then Dr Ghoore visited our home to see if Harry was alright. A special quality about my vet: Dr Ghoore helped a lot when Harry got so unwell and he even didn’t charge anything for that. A ‘Thank You’ note for my vet: Thanks a lot Dr Ghoore! How I came across my vet: From my neighbourhood. How long have I been visiting my vet: For around 16-17 years. Toughest medical challenge faced by me and my pet: Not so far. Role played by my vet: Role of an excellent guide. Col (Dr) Prakash has always been there for my pet, giving me the right advice regarding food habits, grooming and pet related queries. A special quality about my vet: Approachable and an accommodating vet. A ‘Thank You’ note for my vet: Many-many thanks Col (Dr) Prakash. You truly are the best doctor/vet I have ever known. You are an angel! My Boo is lucky to have you as his vet. How I came across my vet: Through a relative. Toughest medical challenge faced by me and my pet: Elsa’s neutering as she had false pregnancy. Role played by my vet in helping to overcome it: He gave me the confidence that I was doing the right thing. A special quality about my vet: Dr Shivprakash is very calm, understanding and always listens to his furry patients. A ‘Thank You’ note for my vet: Dr Shivprakash, thank you very much for being my Elsa and Benji’s doctor. We are lucky to have you as our vet. My Buddy’s Favourite Treates : Royal Canin, chicken and ice cream. My Buddy’s Character Certificate Will Say: The handsomest Lhasa Aspo on earth. A Song Dedicated to My Buddy: Top of The World by The Carpenters. List of Activities We Like Doing the Most: Playing the fool at home. What We Indulge on Sundays: Getting ourselves groomed. What is the Best Trick I have Taught Him: To fight for the sofa next to the air conditioner. 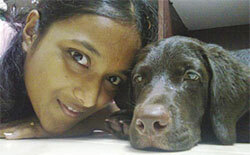 Q: My pet Oscar, a Labrador, is two months old. Is it advisable to take him for grooming at this age? At what age should we start bathing him and how often? Dr K G Umesh: You can groom your puppy every other day to accustom him to this procedure and to being handled. Begin with gentle grooming equipment that does not hurt or irritate the puppy’s skin. Brushes and combs are custom-made for different breeds and lengths of hair; again, it’s important to select the ones that help his coat stay healthy and tangle-free. Dogs only need bathing when they are dirty or on the advice of your veterinarian. Because puppies have sensitive skin, talk to your vet about a shampoo that’s pH balanced just for him. 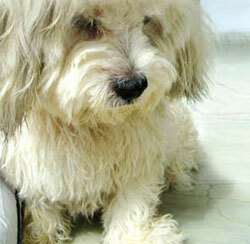 Q: My three-year-old Spitz has been having loose stools over a period of time, sometimes there is vomiting too. She has been given medicines by the vet. She is being fed rice and curd. Please help. Dr KG Umesh: Acute diarrhoea is common, usually self-limiting, and often needs only symptomatic treatment. However, in some dogs, initial symptomatic treatment is ineffective and diarrhoea becomes chronic. The causes of chronic diarrhoea in dogs are multiple, and numerous factors are involved (parasites, colitis, inflammatory bowel diseases). In these patients, sequential application of specific diagnostic or function tests to arrive at accurate diagnosis is essential, so that clinician can prescribe the specific therapy. Q: Recently my seven-year-old GSD named Rambo has been diagnosed with arthritis. Please do help me with some information about the disease and its treatment/management. Dr KG Umesh: Osteoarthritis (OA) can be a progressive problem in which pain and disuse lead to further deterioration of joint movement and function. Physical rehabilitation can play an important role in the management of osteoarthritis. Therapeutic exercise and physical modalities (cryotherapy, thermotherapy, therapeutic ultrasound, and electrical stimulation) may be indicated to enhance motion or reduce pain, allowing improved function. Massage may be beneficial in reducing muscle spasms. In addition, a long-term diet and exercise schedule must be designed to maintain a lean body weight, which also reduces joint stress. Lifestyle changes, such as the use of ramps may also be considered. A number of drugs and other substances are promoted for the treatment including polysulfated glycosaminoglycans and NSAIDs. Q: My dog’s eyes have been watering and every morning he has white residue. We have been wiping the same with cotton dipped in water. Do advice if this is normal. Dr KG Umesh: Abnormal discharge, either watery or cloudy, may indicate problem with tear production or flow or drain. It can also be a sign of infection. Therefore, take him to your vet ASAP. Q: Winnie (eight years old Spaniel) has hypothyroid – she has been prescribed with medicine – twice daily for half an hour before breakfast and dinner. Do advice what food should I feed her. Dr KG Umesh: There is no specific food or nutritional requirement for dogs with hypothyroidism but make sure that the food she eats is balanced and complete. Monitor her body weight and thyroid hormones on regular basis. Q: When my dog urinates, he leaves a white mark on the floor. Is it a symptom of any sickness? Dr KG Umesh: Most dogs have urine which is slightly acidic and may leave such white marks on floor or carpets, etc. However, I suggest you visit your vet to make sure that he is free of urinary tract infection. My Buddy’s Age is: One year and two months. What we indulge on Sundays: Playing, eating and sleeping. What is the best trick I have taught her: Silently taking away the fruits kept on dining table.